Always curious when magazines post images on social media (or slideshows on their websites) but don't cite photog or designer? That's a tangent....but fill me in if you know this info. 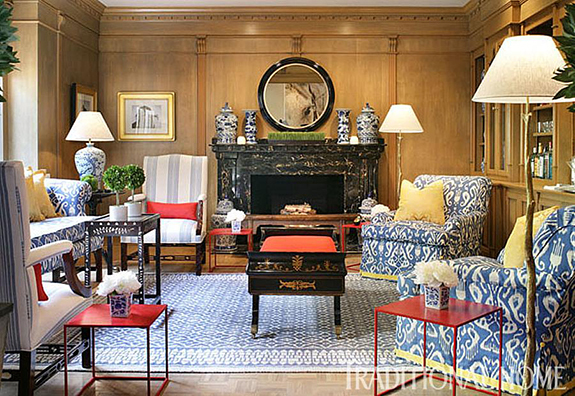 Oh hello paneled living room awash with hues of blue. I love you. Can we talk about the yellow tape trim on those chairs in conjunction with the yellow pillows? I often don't think of yellow as a good color with the brown of wood, but it is certainly working here. Love the touches of black as well...great grounding effect. And the symmetry of those twiggy floor lamps. There's a lot to take in. And I want all of it. FALL. IS. HERE. Hallelujah. Like for real, it's here. Like, I wore boots to work this week and was not hot in them (can we also get a round of applause for the fact that said boots even fit me in my current "blossoming" state?) This all makes me very happy and makes me want to delight in every single weekend from now until January. Hope you have a good one...see you next week! Love the use of fabrics and trim, an overall lovely room!! Blue and white in a unique way. Have a great weekend Daniela! Love the room and the twiggy floor lamps- whimsical element to a gorgeous room!